Sometimes the best thing about a movie is its title. The Spy Who Dumped Me is not that movie, being much funnier than the moth eaten gag that it boasts for a name. 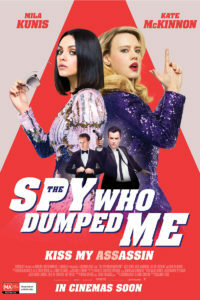 Kate McKinnon is consistently the strongest element of every film that she features in, but The Spy Who Dumped Me is one of the first to properly utilise her. This is one of those films that will get overlooked despite its good nature, its reinforcement of positive female dynamics, and its more-competent-than-it-needs-to-be action choreography. Spy comedies may no longer be all the rage, but The Spy Who Dumped Me is a better example of the genre than Cars 2. Read the full review at Trespass. 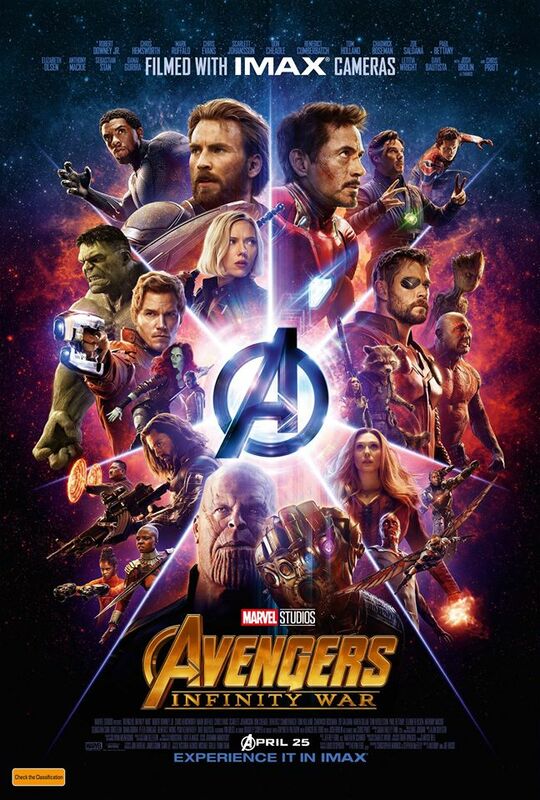 Ten years in the making, Avengers: Infinity War is finally here. The first Avengers film entirely free of Joss Whedon’s influence, Infinity War continues the Russo brothers’ streak while effortlessly incorporating the best of Guardians of the Galaxy Vol 2 and Thor: Ragnarok. This is a big undertaking, and it’s amazing how few missteps Marvel has made along the way. The overt shift to explicit science-fiction and mysticism, and away from the tech-worship of early installments is both welcome and effective, and if you give a damn about any of the characters across the 18 movies that lead to this, it’s difficult not to feel consistently impacted by this two and a half hour barrage of event. Read my full review on Trespass. 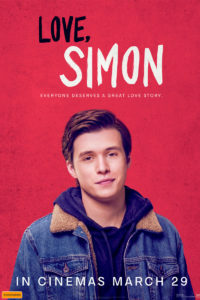 At Trespass, after some delay in hitting Australian shores, my review of Love, Simon, a film that is both important and far superior to the book that it adapts. This is a rare combination and one that should be seized upon. Gay teen movies are becoming more common, and if they can be as good as Love, Simon, we’ve got a lot to look forward to. Read the full review on Trespass. At Trespass, my review of Pacific Rim Uprising. I had a very soft spot for Guillermo del Toro’s original. Uprising can’t hope to live up to that, but it’s still got some scrappy robots to entertain you. Over at Trespass, I’ve reviewed Annihilation. It’s a very different beast to the book that it was based on, and it’s better for it. This is the sort of story that I wanted to get from the book instead of the mundane Lovecraftian bureaucratic red-tape nightmare that Vandermeer served us. Check the review out here. “At last,” said the scientist, her test tube glistening in the fluorescent light of the laboratory, “we have found this decade’s Bring It On!” She smashed the tube to the floor, and out of the smoke emerged a smiling Anna Kendrick and a krumping Rebel Wilson. Unto every generation is unleashed a high school or college movie that speaks to everyone. Kirsten Dunst brought it to us twelve years ago, and now Anna Kendrick and a troupe of considerably less Aryan, less Buffy alumni, types are prepared to bring it to the next level. Pitch Perfect is a smile of a movie, designed to make the audience feel good the whole way through without manipulating them into doing that. It’s got a lot of laughs, too, with the audience reacting to some deliberately horrible jokes (“a ca’scuse me?”) even on their fourth go-round. For something that could have easily been a cynical exercise in selling endless horrible sounding covers on iTunes, rather more thought went into this film than many might have suspected. This is ultimately not a musical, but a comedy about a group of girls who become friends, and the alternately awful and misguided boys who they have designated as their enemies. Perhaps I have never been infinite. I have definitely never been an American teen, nor did I ever attend an American high school. To be an American teen is an experience not really comparable to any other in the world; while higher education has at least some commonalities the world over, and adults are much the same everywhere, the American teen lifestyle as promoted on film is uniquely homogeneous and largely alien. The American high school milieu is so foreign that it should realistically be almost as unmarketable to Australia as the infernal baseball film. But The Perks of Being a Wallflower is not a hard sell simply because of its alien subject matter; it’s a hard sell because no one in it is human. No one in this film is someone you would wish to exist, or someone who would actually be able to exist in the real world. No one in this film or the novel it is based upon has a life outside the celluloid or the page. They have only what author, screenwriter and director Stephen Chbosky has to offer them, which is precisely nothing. Desperately grasping at a desire not to be inert, The Perks of Being a Wallflower goes beyond simple excruciation. Every moment of this film, save its quite nice soundtrack, conspires to make the viewer hate it. And yet I am alone. I am the proverbial wallflower at the school dance. I am standing on the outside looking in at a party of people toasting Charlie, never quite understanding what they see in him. Not just unwilling, but unable to see exactly what there is to this bloodless mannequin of a human being. I hated this film more than I normally hate anything. I can’t say for certain that I hated it more than its attendant novel (and I certainly hated that), but I can safely say that this is one of the worst cinematic experiences of my life to date, and I wouldn’t wish it upon anyone. If someone wasn’t holding my hand, I possibly would have run from the cinema. This is not a profitable way to spend 102 long minutes. This movie is infinite. Someone has been waiting for Prometheus for 33 years. I hope they’re not disappointed. Me? Please, I’m only 26. Regardless, I’m satisfied. Others might not be so happy, but I don’t care: it’s my movie. They don’t need it, and they can’t have it. 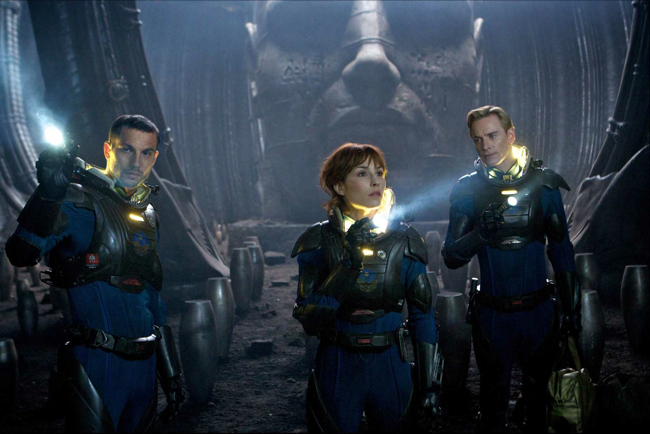 Prometheus is kind of an entry in the Alien canon. It’s actually pretty unambiguous about that, but some people will want to ignore the various “clues” – that is, the names of entities featured in later Alien films, the designs inspired by Giger, the … Well, the everything. This is an Alien film, with echoes of the original and with something new besides. It’s not the evolution that Aliens represented, nor the declension of the latter two films. It’s its own film, and a hard film to classify at that. But it’s good. It’s good. The Official Batrock.net 84th Oscars After Party! I must say that I was pleasantly surprised by the Oscars this year. As a piece of television entertainment, there was barely any drag. Apart from the In Memoriam roll, which doesn’t count, there was only one montage, and it was twenty minutes in. Last year I said that hosts were irrelevant, and that the Oscars are boring and bloated anyway. It may partly be thanks to the fact that I couldn’t watch it live this year and was able to skip the ads with extreme prejudice, but I was close enough to entertained by the pageantry and never felt bored or like cussing out the production. So maybe this is down to Billy Crystal, who actually had a presence beyond last year’s intermittent appearances of Anne Hathaway and James Franco, everyone’s favourite scapegoats. Crystal’s opening song wasn’t particularly inspired (“Mr. Joey” was only marginally less engaging than War Horse itself) and, like every single “host inserted into famous movie scenes of the last year” segment to date, this year’s showreel ran out of steam fairly quickly after an impressive start. Despite this, Crystal represents stability. He’s a safety blanket. As he said, “Nothing can take the sting out of an economic downturn like millionaires presenting each other gold statues.” He’s the host the people of Chapter 11 Theatre need, and it’s a happy coincidence that he’s also the one they wanted. Rather than taking a backseat, Crystal was all over the show. It’s unfortunate that the lesson we take away from this is not “give the Oscar hosts good material to work with and don’t make them come across as aloof bastids and the show might work better”, but “we should never give anyone new a chance; as long as Crystal draws breath we don’t have to risk employing Allen Ginsberg and his like e’er again”. I’ve since looked this up and it seems no one liked Crystal. You vultures will never be happy! He wasn’t even the baffling part of the show: why was Edward Norton telling us what he thinks of movies? What’s he done lately? Nothing for nobody. At any rate, the ceremony is a life support system for giving a bunch of golden dudes to a bunch of rich or aspiring-to-be-rich dudes and dudettes. Let’s examine the outcomes. Hugo and The Artist tied with five awards each, with The Artist taking out the bigger ones of those. Once Dujardin took away his Best Actor award, Crystal informed us that “France is going nuts right now. Or whatever they have instead of joy,” which was the weirdest and cheapest joke to make given the circumstances. What I learned from all of these wins for The Artist is that its cast and crew felt a genuine love and enthusiasm for their work, and that obviously translated across to a lot of the Academy voters. It’s a shame that this didn’t come across to me, and that I’m just going to look at the Best Picture and Director wins as oddities in the long history of the Oscars. I would try to watch The Artist again, but it’s a movie that’s not designed to be consumed repeatedly. By contrast, I’m eager to see The Descendants, Hugo and Midnight in Paris again. Scorsese can be happy with the recognition that Hugo deserved, but I legitimately feel that his love is more apparent on the screen without overwhelming. Unlike Hazanavicius’ work, it feels natural rather than forced – which I realise now was not Hazanavicius’ intent at all. I’m quite happy with Dujardin’s win because he’s a genuinely cool dude who tried his darnedest and came through. As for Meryl Streep, well. I’m not going to complain about her being a career nominee, because that makes no sense: if you’re consistently good enough to secure a nomination, then that’s just a fact. Equally factual is that Streep’s frustrating performance in a less than half baked film was not the best of the five nominees. Michelle Williams should have taken this away: the clip they used to showcase her performance was magical and reminded me that she really is one of the best actresses currently working. Speaking of showcase clips: the Oscars were hell bent on spoiling the movies this year. Key scenes from The Girl With The Dragon Tattoo, Hugo and The Artist were all prominently featured. When Natalie Portman recapped to Dujardin everything that he did in The Artist, including several of the small delights that the big reveals provided, I couldn’t help but recoil in horror. Most people who go to see The Artist because of its win will probably forget everything they’ve been told, but it’s the principle of the thing. Also less ambiguous is footage of Daniel Craig being gassed and the identity of his antagoniser being shown. There may be a statute of limitation on spoilers, but I’m not convinced that one’s passed yet. I was impressed with both screenwriting credits, because I was very fond of Midnight in Paris and Woody Allen was coming from a personal place of love, both indulging his nostalgic urges and recognising their dangers. The Descendants, apart from being a very good script, means that Jim Rash is now the recipient of an Academy Award. Community, a show that has been consistently lining up sharks and jumping them for a good season and a half now, now stars an Oscar winner. The rest of the show was pleasant enough, and for the first time in years I didn’t get bored and wish for the embrace of death. Good show, Academy. Good show. PS. In my notes I may have referred to Gwyneth Paltrow as “Goopy McGee”. I’m not proud, but I have no regrets. The Official Batrock.net 84th Academy Awards Hoedown! The annual bloodbath is upon us! The most notable films of 2011 have been filtered through the old white man machine, survived the gauntlet of lesser awards, and have been dragged onto the world stage for the only event that truly matters: the Academy Awards. As always, I shall take you on an 11th hour guided tour of the films that have enchanted and frustrated audiences the world over and caught the eye of the Academy over the last year. Some are worthy, some decidedly less so. Only one film can win each category, and the rest will be consigned to the scrapheap of history. Unless you ask Matt Dillon, who insists that no one remembers the winner, only the nominees (he lost that year to George Clooney). If anyone can remember anything positive about Crash, I don’t want to know them. Let the games begin, and may fortune be ever in your favour!